Welcome to the wonderful world of trolls! Troll dolls come in many different sizes and shapes as well as from different manufacturers. Trolls became a fad in the 1960’s through the 1990’s. This website is designed to help you identify your troll dolls and provide information on all the various troll doll items. Whether you are a huge collector or just interested in the history of troll dolls, you will be amazed at the number troll dolls that were made . Just select the manufacturer of the troll that you are interested in from the tabs above. Not sure who made your troll or kind of troll you have, then go to the page on troll identification. The first trolls were created by Thomas Dam in the 1950′s in Denmark. Troll Dolls became a fad in the 1960′s. These early trolls are known as the vintage trolls. The most popular vintage trolls are the Dam Trolls. Early troll manufacturers were Dam Things, Uneeda (Wishnik), and Scandanivia House. Early trolls had mostly felt clothing and mohair. Trolls reemerged as a fad in the 1980′s and early 1990′s. Russ Company flooded the market with cheap trolls. In addition, Dam Things sold their trolls under the new name of Norfin trolls. While Russ concentrated on the volume of trolls, Norfin trolls had better features and were well made. This fact can be seen in the resale and collectible values of the trolls on Ebay. You can still buy trolls today but collectors will pay a lot more money for a older collectible troll. In addition to dolls, manufacturers also made paper dolls, key chain toys, and party supplies. Troll birthday supplies included a Wilton cake pan, paper napkins, cups, and paper plates. Everything that you would need for a fun troll birthday party. 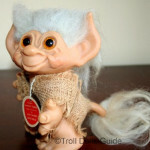 Dam Tailed Trolls Highly prized in collections are the vintage Dam Tailed trolls.